Timothy Pardee, MD, PhD, conducts preclinical research and clinical trials in hematology and oncology, specializing in acute leukemia translational research. His partnerships with industry include evaluating therapeutics in novel preclinical models of leukemia and investigating the efficacy of leukemia therapeutics in early-phase clinical trials in order to improve patient diagnosis, treatment and outcomes. Timothy Pardee, MD, PhD, completed a doctoral degree in biochemistry at the University of Buffalo, after which he earned his medical degree from the same university in 2003. 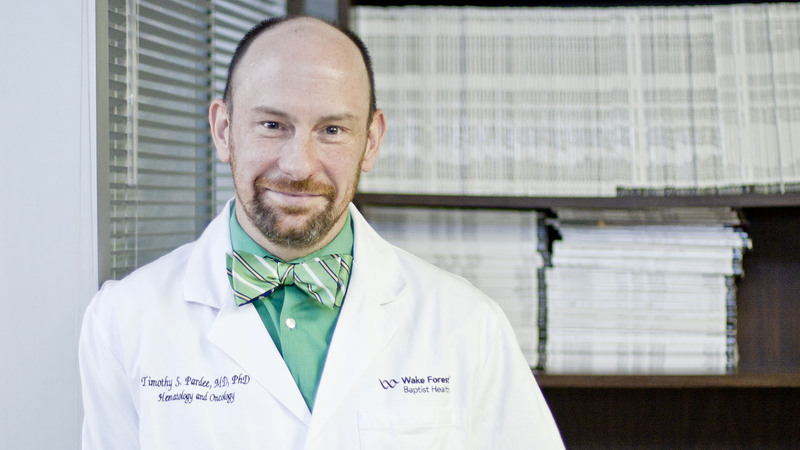 He completed an internal medicine residency at Massachusetts General Hospital, worked as a hematology and oncology fellow at Stony Brook University Medical Center and held a postdoctoral fellowship in the Scott Lowe Laboratory at Cold Spring Harbor before joining the hematology and oncology department at Wake Forest School of Medicine in 2009. In addition to practicing clinically, Pardee models novel therapeutics in order to translate them into clinical trials. Using accurate and novel mouse models of leukemia, he collaborates with other researchers to develop therapeutics that treat hematologic malignancies, including KPC34, a drug that has the potential to treat acute lymphoblastic leukemia. Currently, he also researches another therapeutic, F10, to determine its efficacy in acute myeloid and lymphoblastic leukemia models. Pardee also runs early-phase clinical trials in collaboration with industry partners to investigate the efficacy of leukemia therapeutics in patients. Currently, he studies CPI-613, a therapeutic that inhibits the ability of cancer cells to use their mitochondria and has the potential to provide a treatment option for patients with advanced hematologic malignancies. With this clinical trial and others, he aims to develop pharmaceuticals that will improve patient diagnosis, treatment and outcomes. Throughout his career and education, Pardee pursued research that would translate into improved patient outcomes. He finds the molecular biology of acute leukemia fascinating and believes that research into hematology and oncology can aid patients suffering from serious illnesses. He feels privileged to work with leukemia patients. He endeavors to help them live longer, fuller lives by walking with them through the difficult stages of disease and developing treatments to improve their outcomes. Pardee believes that industry partners are essential in order to conduct innovative clinical trials. He frequently collaborates with pharmaceutical and biotech companies to test novel therapeutics. Many of his early-phase clinical trials stem from collaborations with industry, and he realizes that partnering with companies results in the development of therapeutics that will benefit his patients. KPC34 is a therapeutic developed by Wake Forest Baptist researchers to treat acute leukemia. Director of the Tumor Tissue Core, Kucera researches lipid metabolism and develops therapeutics for the treatment of cancers, as well as assessing anticancer and antiviral therapeutics.